With equity indexes powering higher, the VIX rapidly cooled, settling -13.9% @ 17.70 - the lowest daily close since Dec'30th 2015. 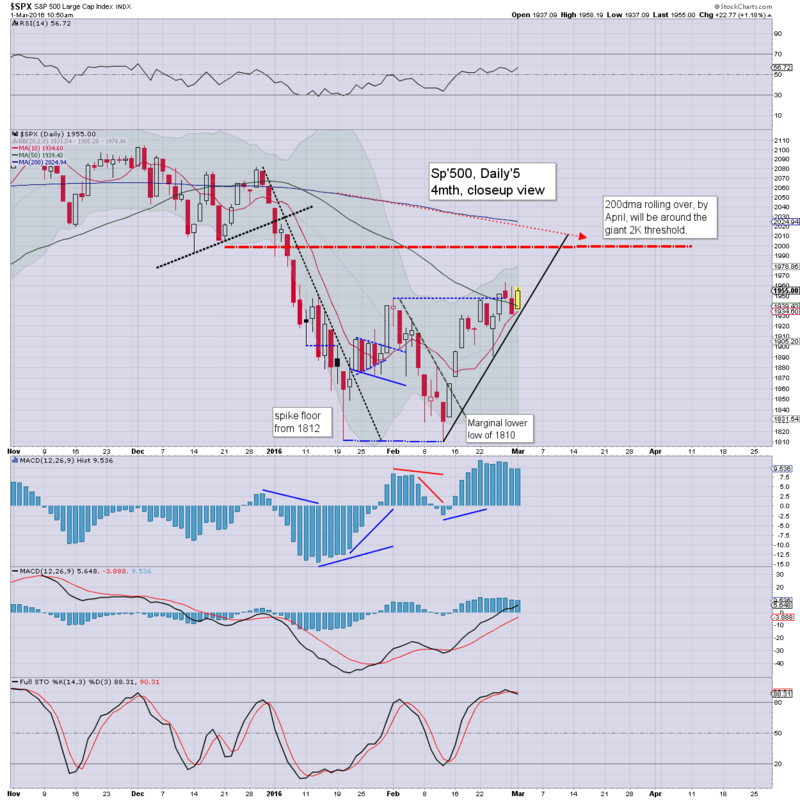 The near term outlook offers the sp'1980/90s, and that will likely equate to VIX 16s. 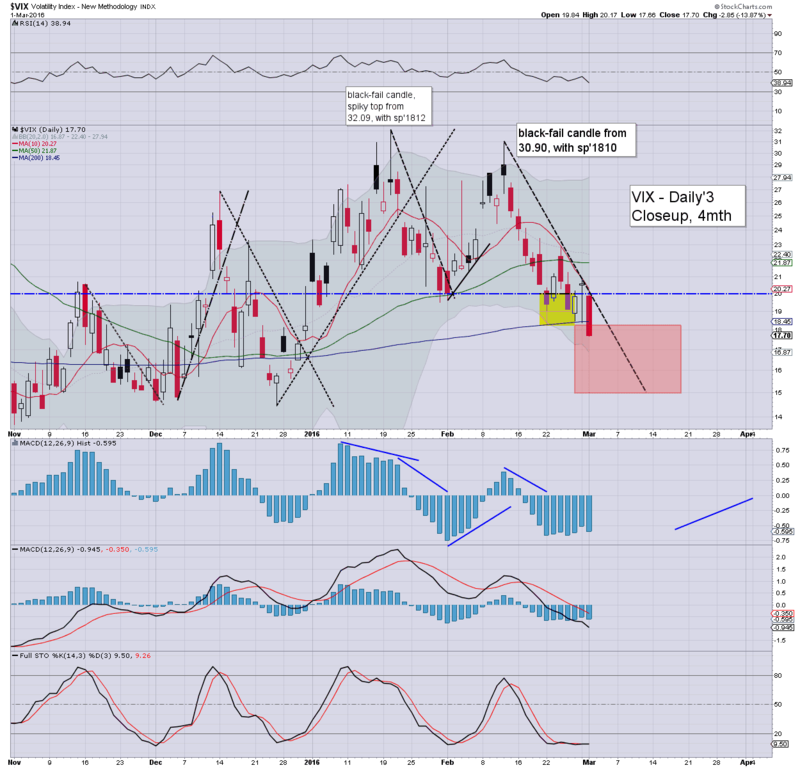 Broadly, the VIX looks set to remain subdued for another 10 trading days. Not surprisingly, with equities seeing very significant gains, the VIX effectively imploded, and was ground lower across the day. There will clearly be some degree of resistance around the sp'2K threshold, and VIX might manage to climb from the 16s to around 19/20. 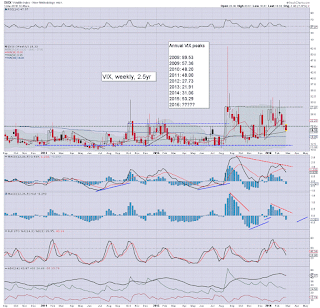 However, it would safe to say, the VIX will likely remain broadly subdued into mid March. The 30s look just about possible by end March - if sp' loses the 1900 threshold, but that in itself will not be easy. Clearly, the 40/50s are viable no earlier than April. 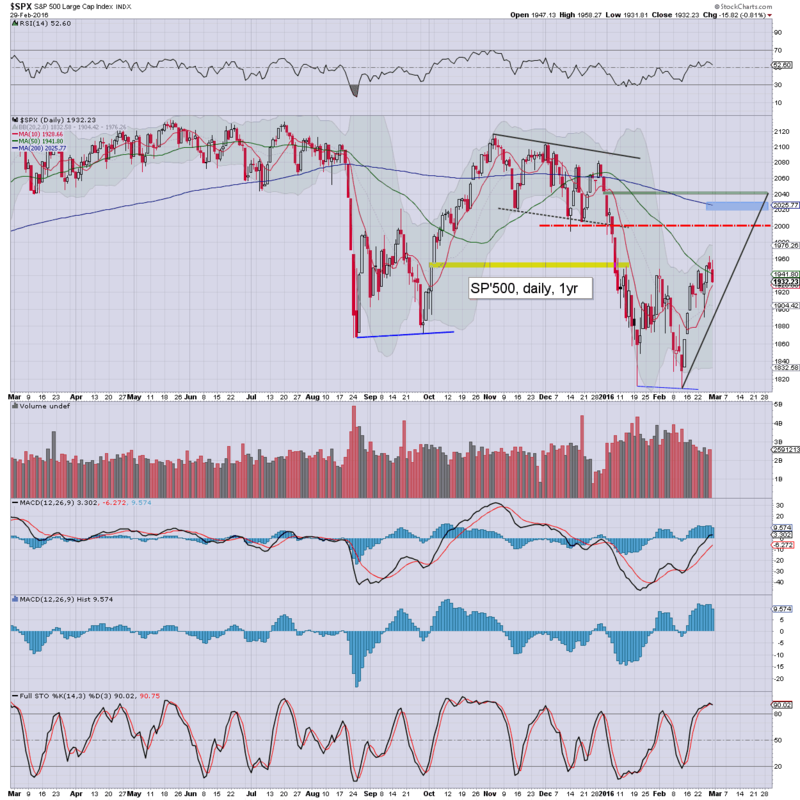 US equity indexes closed powerfully higher, sp +46pts @ 1978. The two leaders - Trans/R2K, settled higher by 2.1% and 2.0% respectively. 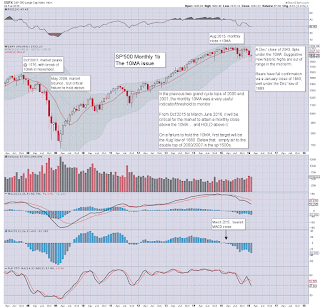 Near term outlook offers further upside to the 1980/90s, with 2K more viable next week. A peak around mid March looks on track, before a critical rollover. Suffice to add... pretty crazy huh? The 2K threshold is now within range.. and whether later this week.. or next.. it makes little difference. The real issue is how will the market trade after mid March. US equity indexes are set for very significant net daily gains, entirely negating the recent two days of moderate weakness. 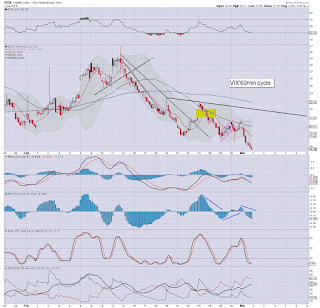 A weekly close in the 1980/90s looks very probable, along with VIX 17/16s.. reflecting a market that is almost fully back to 'everything is fine again' mode. Of course, the reality is far from from this current hysteria. 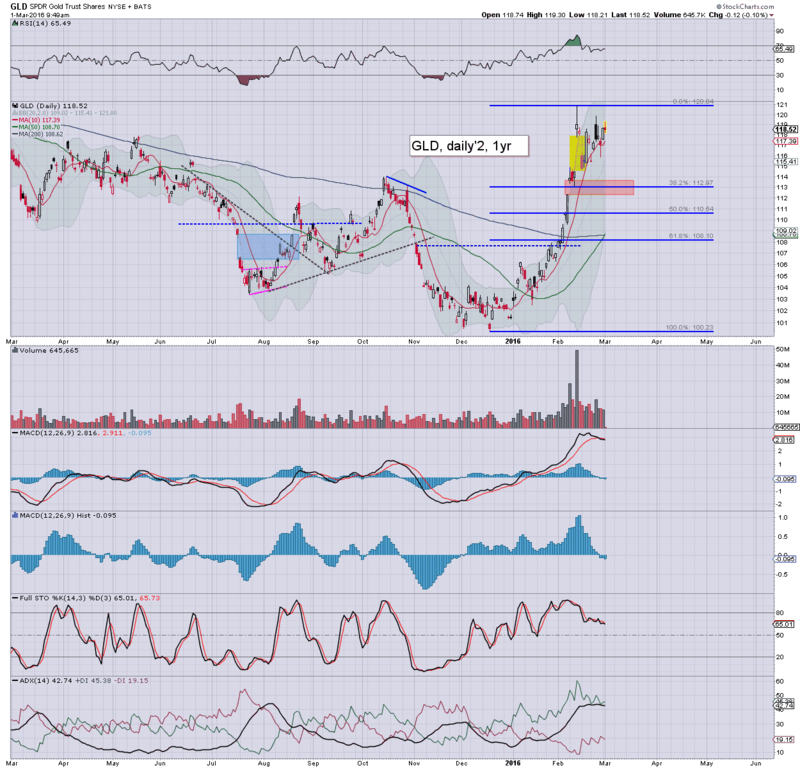 For me, I am really liking the price action/structure in Gold/miners, and believe it will be a powerful indirect signal of a market peak in about two weeks time. 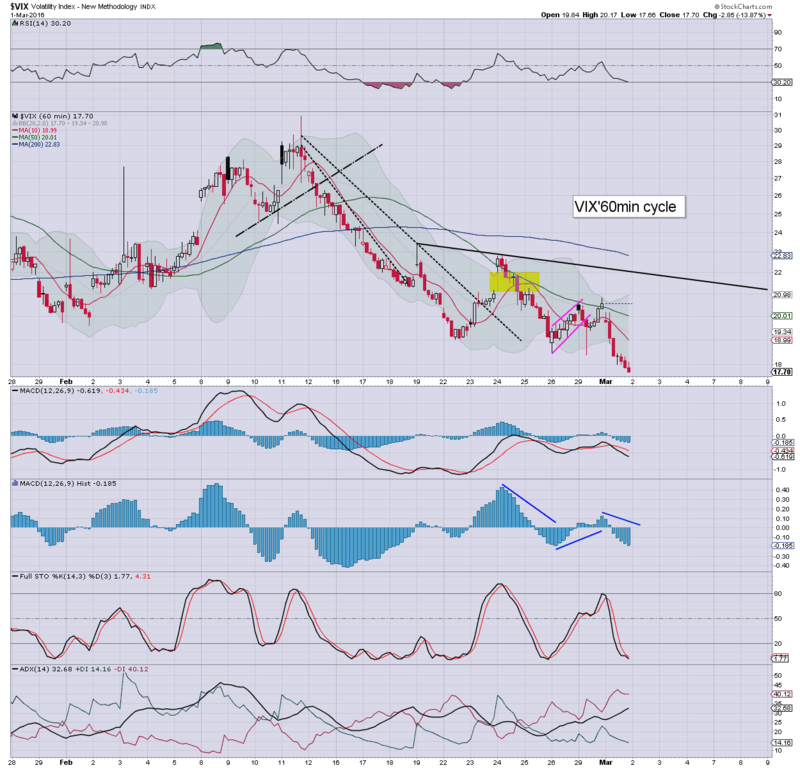 .. and I am most certainly wishing to be long metals/miners in the next cycle. With each point closer to the big sp'2K threshold, the bull maniacs are increasingly confident that we've seen the low for the year at 1810, and are now set for broad upside for the rest of 2016. After all, everything is fine now, right? Capitulation has also occurred in the oil/gas/mining sector, yes? 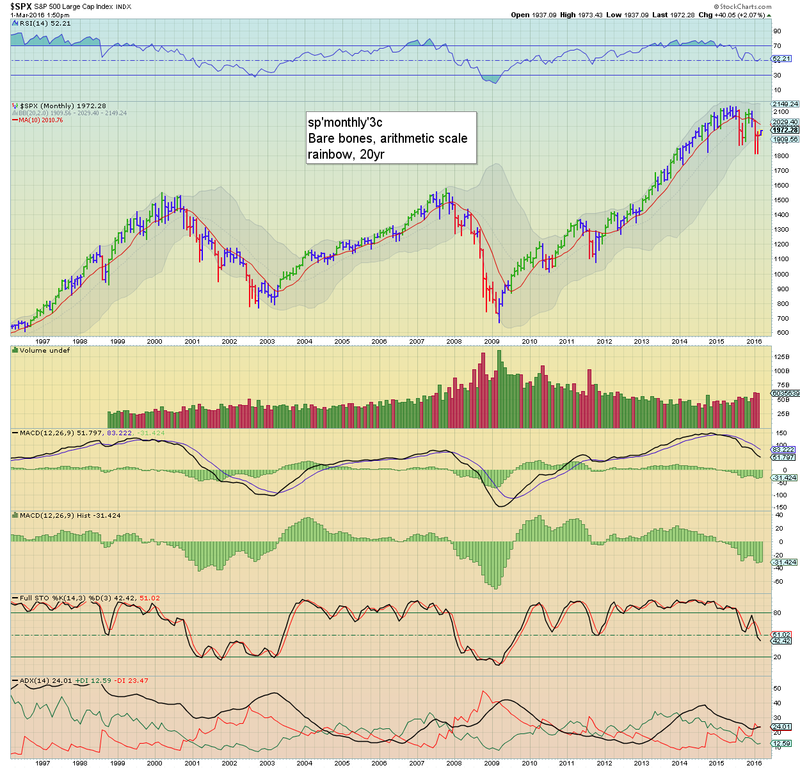 I think some merely need to go stare at the above chart for a full hour.. if not the next two weeks. 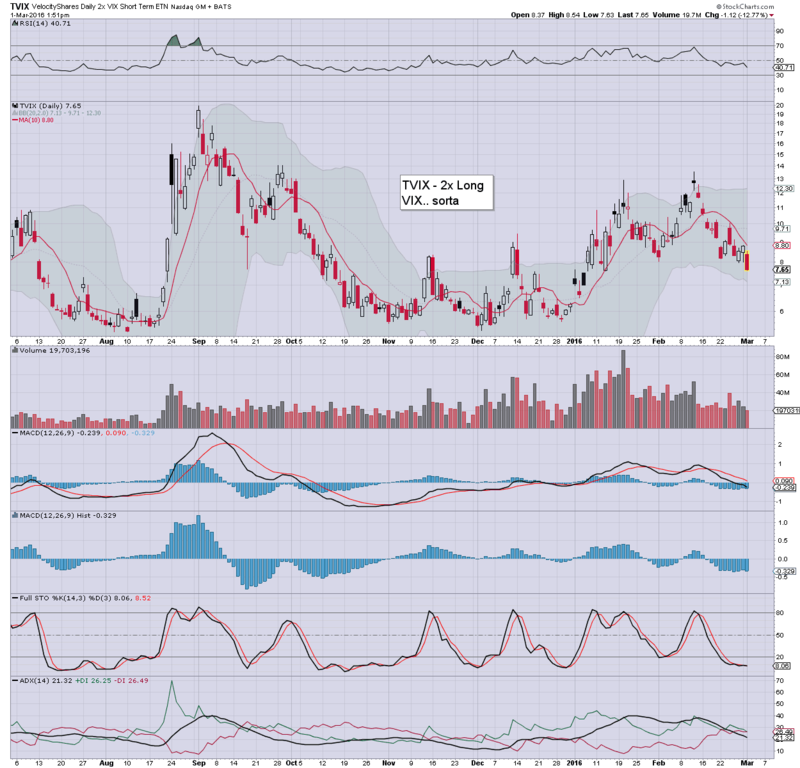 The 2x leveraged TVIX is now in the mid $7s, and given another 2 weeks... the 6s look rather easy. Maybe 5s. 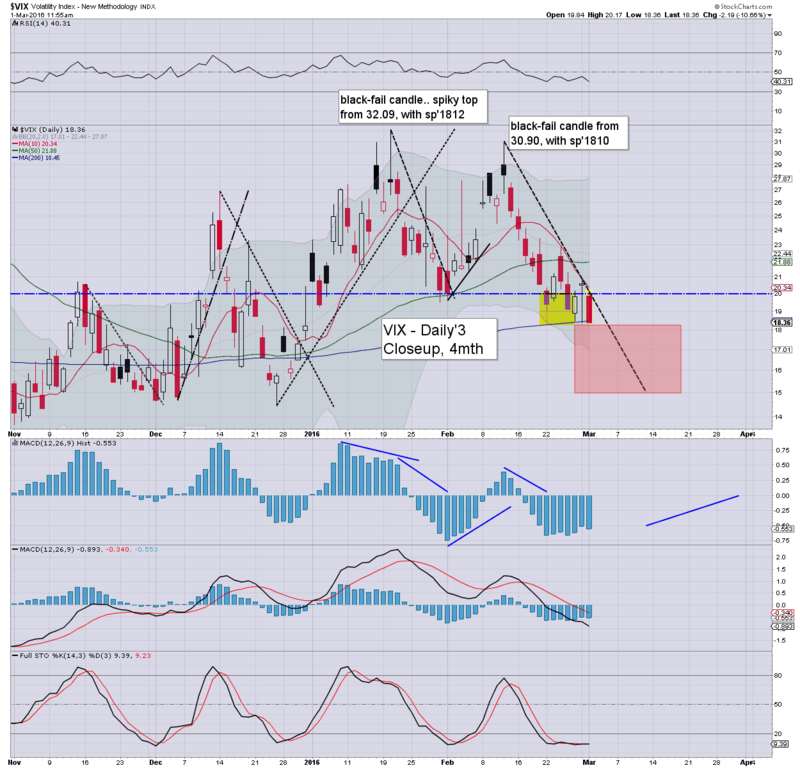 In any case... VIX looks set to remain subdued. 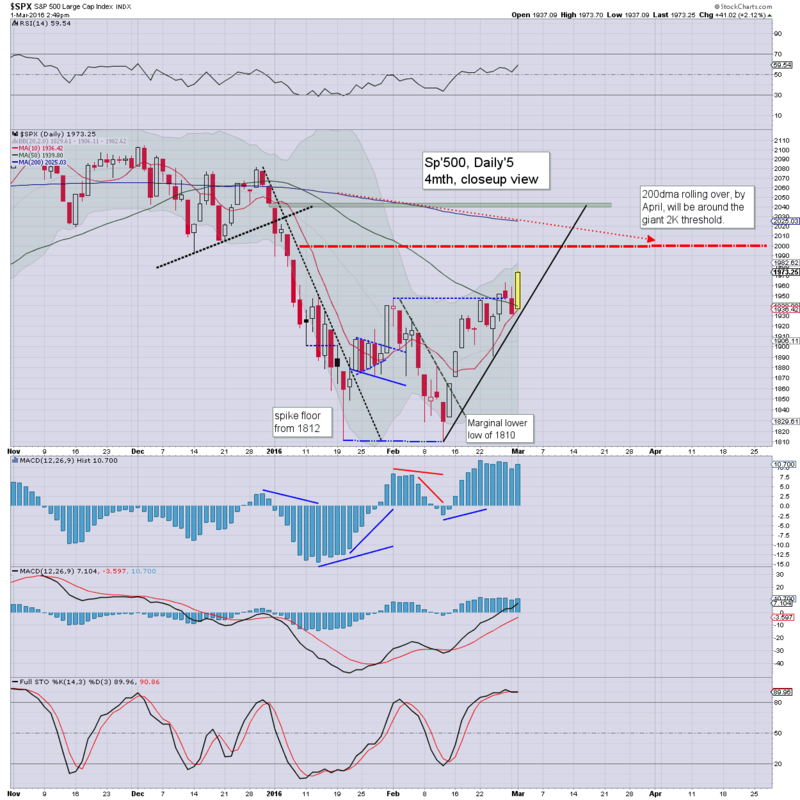 US equities remain significantly higher, having hit a new cycle high of sp'1970 - with VIX 18.01. It seems extremely probable that the psy' level of 2K will be hit next week, with a viable test of the 200dma (currently @ 2025) for most stocks by mid March. A notable green candle on the weekly equity 'rainbow' chart, with a bullish MACD cross due at next Monday's open. The setup/pattern is very similar to July-August 2008, but more on that later. *its good to from YOU today... hard to keep up with everything.. and I appreciate the heads-up on some things that I've not noticed. 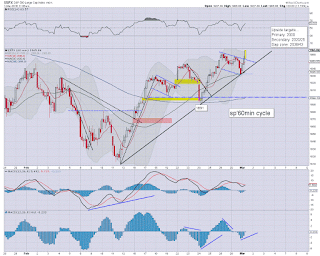 US equities remain significantly higher, with a clear break above the recent high of sp'1962. The door is now wide open to the 1980/90s by the Friday close. 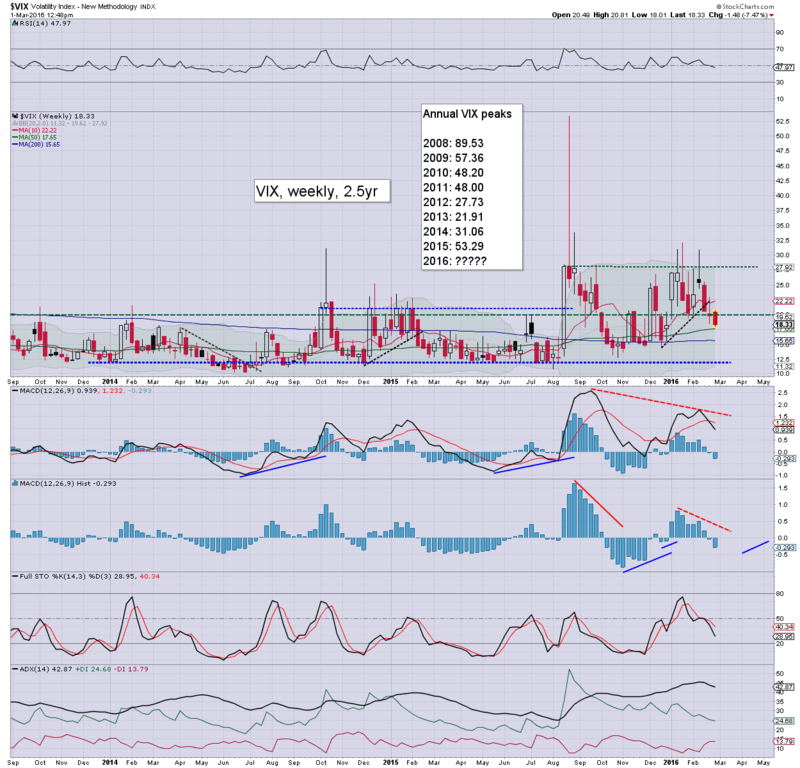 VIX is naturally in strong cooling mode, -10% in the 18.40s, the 17/16s look due by Friday. Well, for those still resolutely holding short... another two weeks of pain to go. Where we max out.. difficult to say, but clearly, the 2K is likely to be hit by mid March. 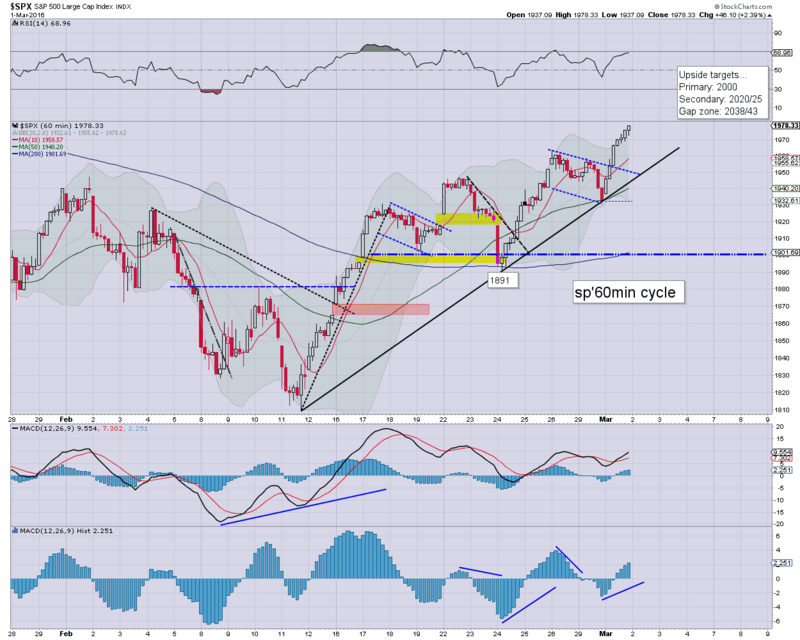 US equities have shaken off initial shaky price action, and powered back upward, with the sp +23pts @ 1955. 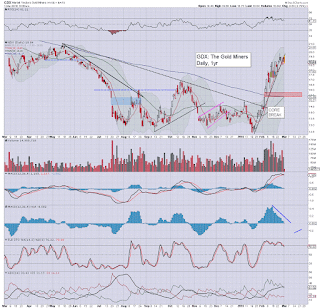 First soft target is the recent 1962 high, after that... the daily cycles will be offering the 1990s this Friday. 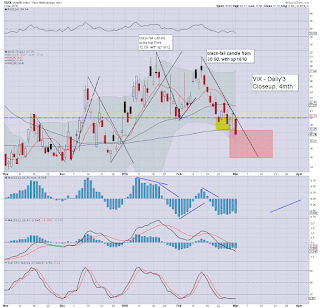 Metals have seen a strong reversal, with Gold now -$8, and that is not helping the miners! 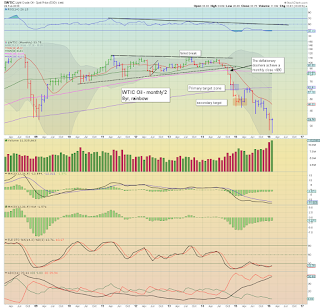 Whether you want to blame Dudley, or just a lack of downside power, we still look headed upward for another few weeks. 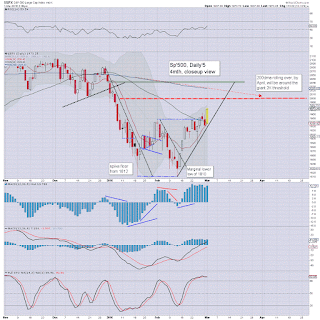 Clearly though, we're getting kinda close to 'best bull case'... as even Oscar recognises. 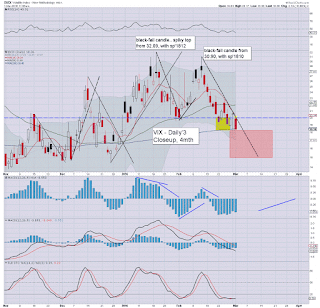 Both the miners and gold/silver are due a retrace into mid March. Of course, the February gains were EXTREMELY important, signifying a multi-year breakout. *I will look to be long GLD and GDX in around 11 trading days. After the retrace... first targets will be $125 and $25 respectively. Rainy... but mild... spring is almost here. 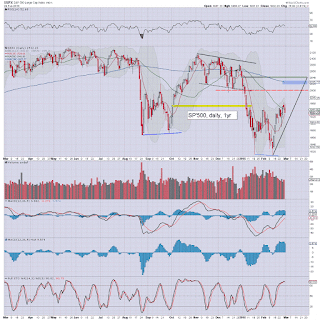 US equity indexes open moderately higher, although the gains are a little shaky. 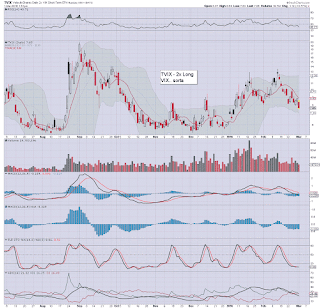 Metals have reversed from early gains, with Gold -$1, and Silver -0.1%, the related miners look equally vulnerable into mid March. Oil has seen a sharp reversal from early gains of 2.0%... to -0.9%. *PMI manufacturing: 51.3, not great... but neither terrible. Any equity bear hoping for sustained action under the big sp'1900 threshold in the near term is set for a few more weeks of frustration. 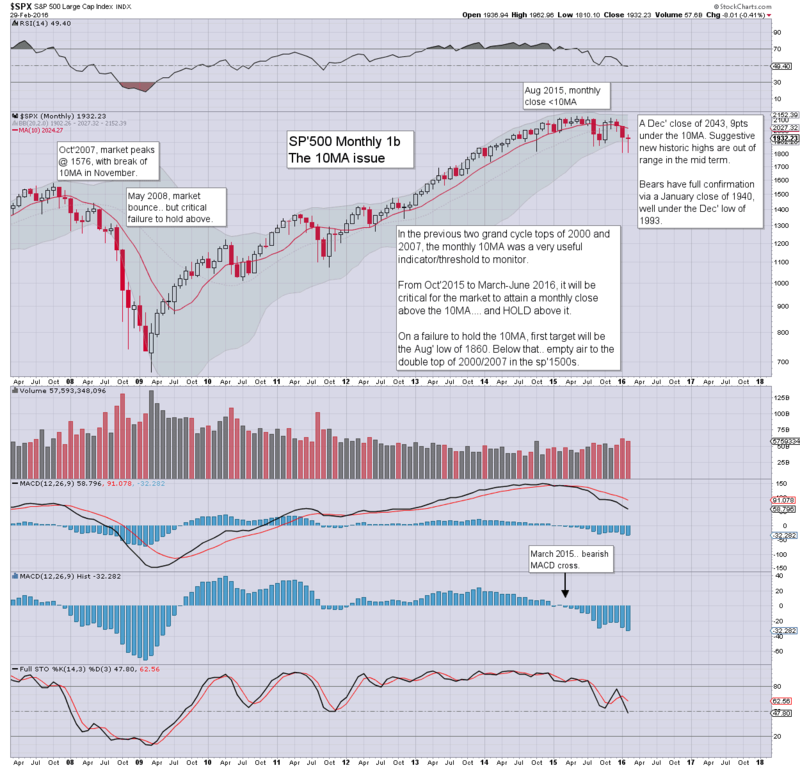 **a new month, and the monthly MACD cycles have naturally adjusted.... but I'll cover that later. Good morning. US equity futures are broadly higher, sp +16pts, we're set to open at 1948. USD is u/c in the DXY 98.20s. Metals remain strong, Gold +$6, with Silver +0.8%. Oil is again helping the market mood, +2.0% in the $34s. So... Fed official Dudley appeared in Asia overnight, and with talk of 'no rate hikes', the market jumped. 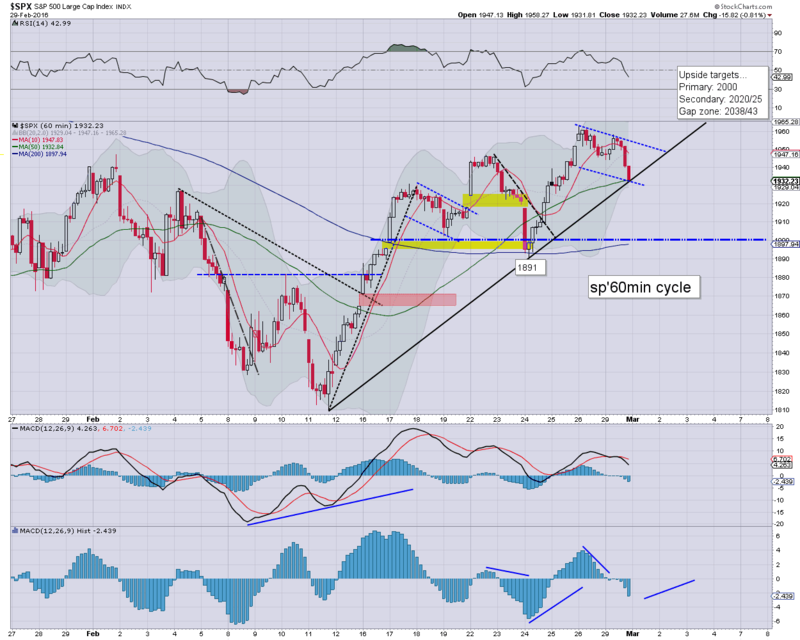 Equities look set to build gains across the day, as the hourly cycle will support. 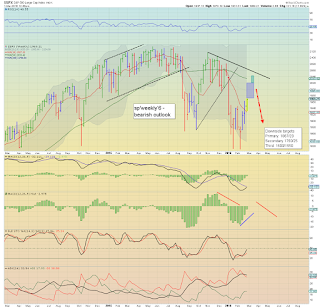 If the market likes the jobs data this Friday, there is little reason why we won't be trading in the sp'1980/90s. Again, 2K looks more viable next week. Good wishes for 'Super Tuesday'. 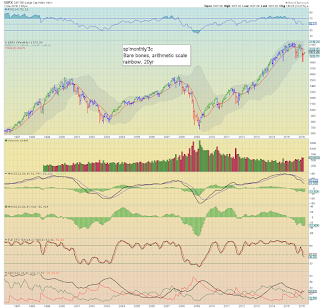 It was a rather dynamic month, with the sp'500 breaking a multi-year low of 1810, swinging higher to 1962, and settling net lower by -8pts (0.4%) @ 1932. The USD cooled, -1.5% at DXY 98.19. 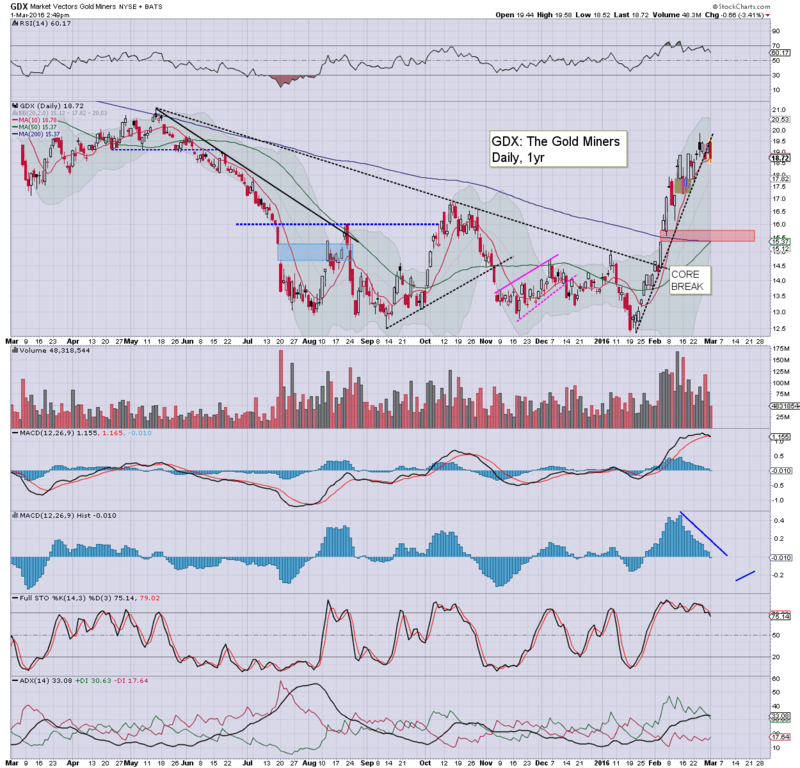 WTIC Oil settled +$0.01 at $33.75. 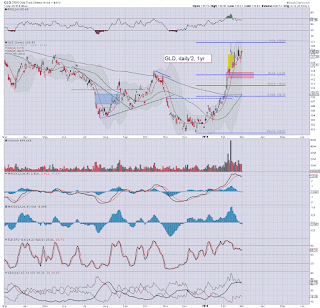 Copper managed a sig' gain, +$0.07 (3.3%) @ $2.13. It was the third consecutive net monthly decline, which hasn't happened since late 2011. 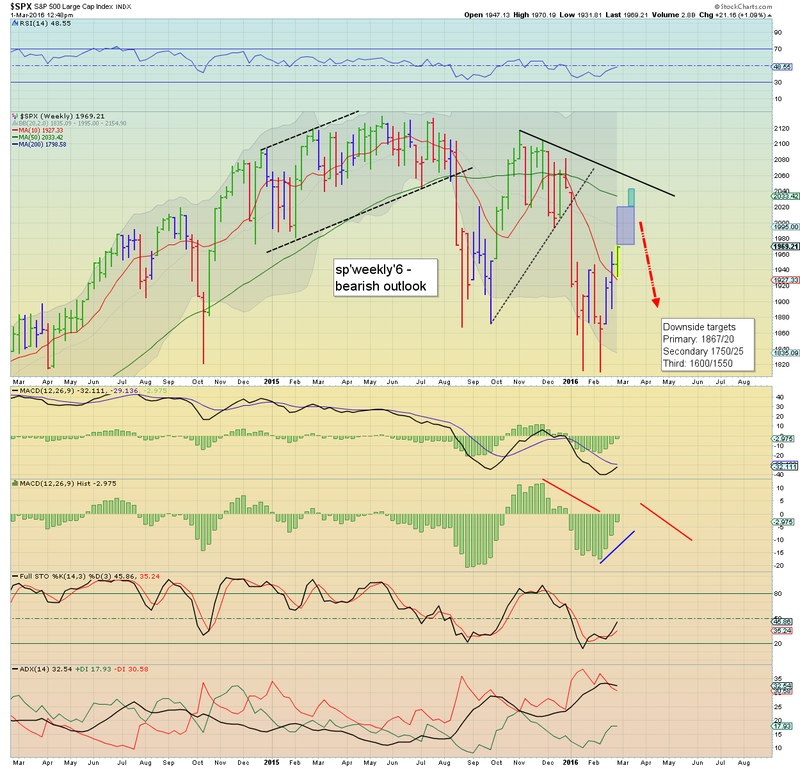 Most importantly for the equity bears, the sp'500 saw another close under the 10MA. Even if the market can battle upward into mid March, so long as the March close is under 2K (preferably <1930), the broader bearish outlook remains on track. 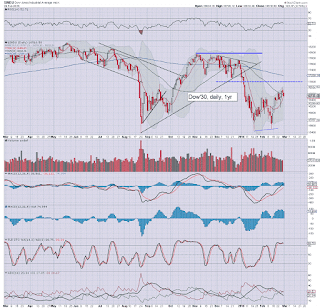 Best guess: further upside to the 2000/2040 zone by mid March, with increasingly powerful downside across April/May to the sp'1600s. 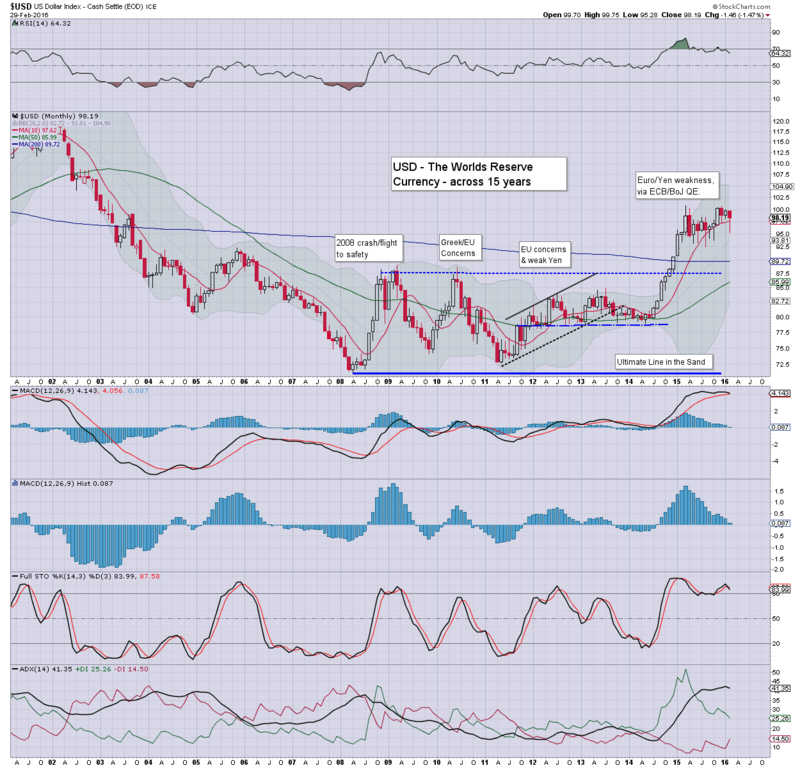 Despite some weakness to DXY 95.28, the USD clawed higher into end month, with yet another close above the monthly 10MA. 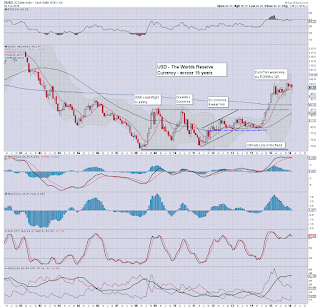 A monthly close above the giant DXY 100 threshold remains due, and from there, next target are the 120s. 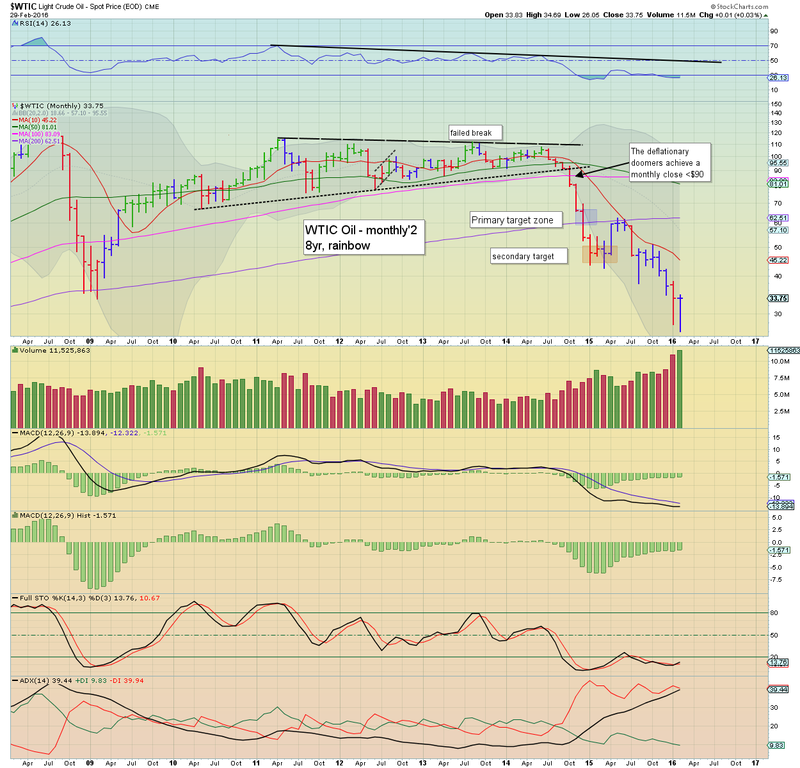 WTIC oil closed the month effectively flat, having rallied from an intra month low of $26.05. Near term outlook threatens a brief climb to the $38/40 zone. Sustained action >40 looks extremely unlikely, as the over-supply issue remains entirely unaddressed. 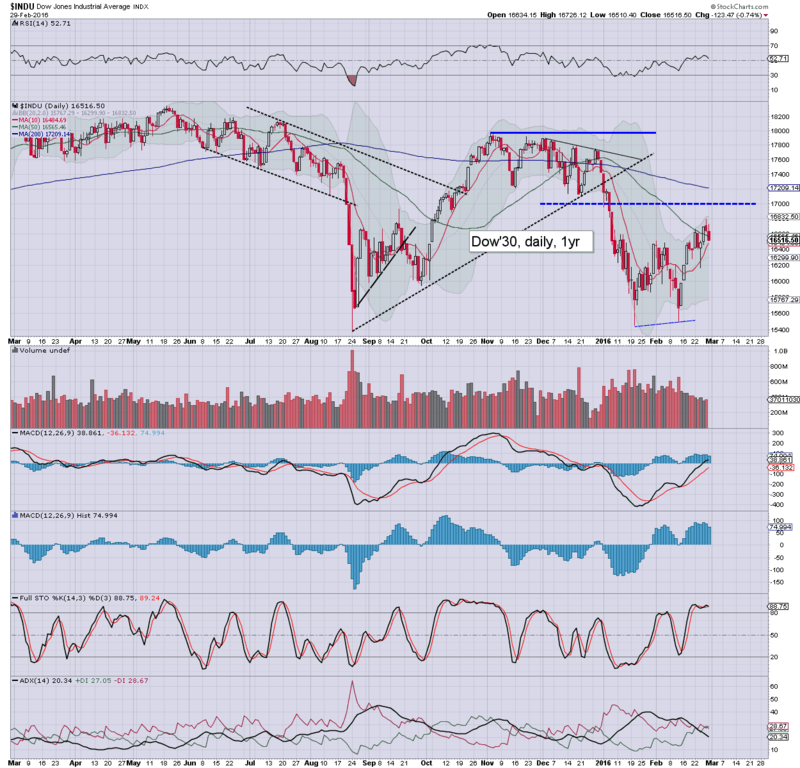 WTIC Oil looks set for capitulation under the $20 threshold. 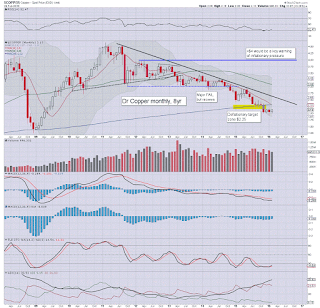 Copper saw a significant net monthly gain of 3%, but remains broadly stuck in the low $2s. 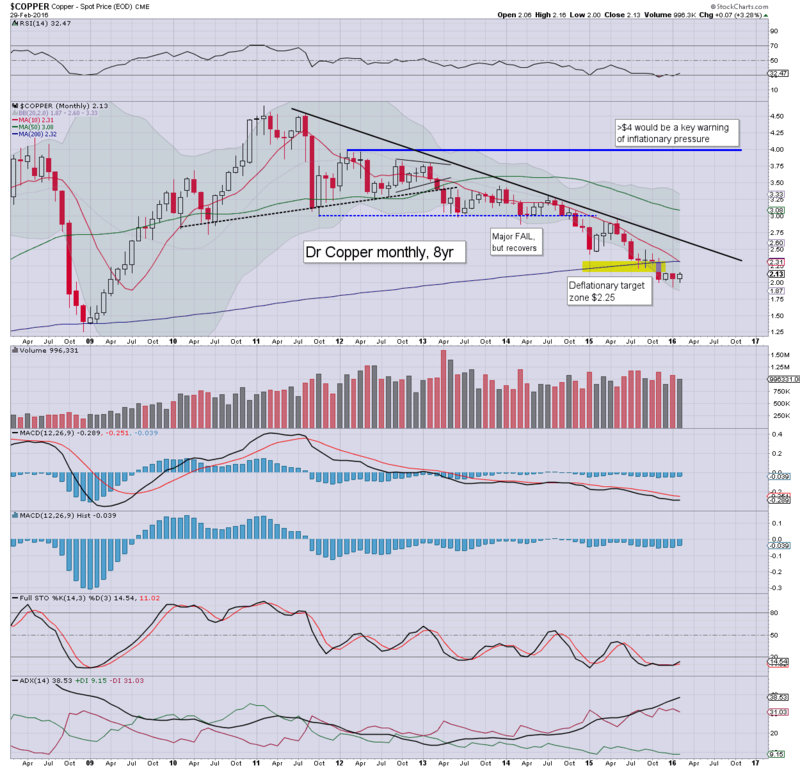 If the USD can put in a monthly close >DXY 100, most commodities - especially copper, would likely break new multi-year lows. Tuesday will see PMI/ISM manu', and construction data. Suffice to add, not the most bullish of ends to a month, but neither was it a decisive victory for the equity bears. It would still seem the market will manage to see further upside into mid March.. or at the very least, churn sideways in the mid 1900s.